Turning a side project into a thriving business. 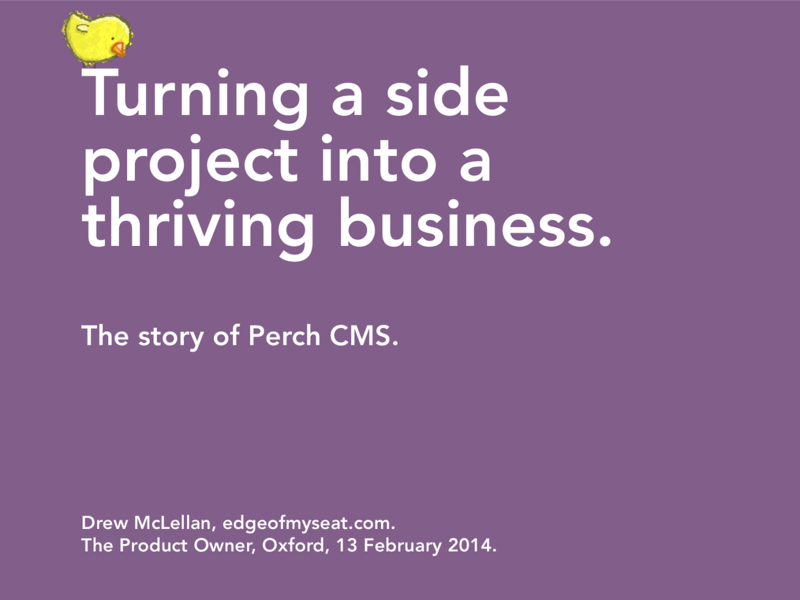 The story of Perch CMS. Drew McLellan, edgeofmyseat.com. The Product Owner, Oxford, 13 February 2014.
edgeofmyseat.com Started by Rachel Andrew in 2001 as a web development services company. edgeofmyseat.com I joined the company in 2007, from Yahoo!. We set about turning common ‘bespoke’ solutions in to productised packages. Something had to change. By 2009, our business model needed rethinking. We were missing our audience. Not every project is big. Clients were looking for a lower cost option for their smaller projects. Let’s build small. Set about creating something our clients could implement themselves. What if we sold it to a broader audience? Web designers handle the projects, we just provide the software. We could sell to the audience we were already reaching. Software sales are not charged T&M. It’s a very crowded market. There are dozens of CMS options in the market, many are free. It needed to be inexpensive. Less than an hour of work. Cheap enough to be expensed on a company card without prior sign-off. What is Perch? A content management system - software to enable non-technical users to change the content on their website. For small websites. All those sites for guest houses, restaurants, clubs, places of worship. Bread-and-butter web design projects. Freelancers and small agencies. Our ideal target customer. Tough decisions. Simplicity over comprehensiveness. UI over code. Text over WYSIWYG. Lightness over control. Productising is hard. Built from scratch, but used proven ideas and concepts learned from client work. 12 days to MVP. 6 days (3 weekends) coding. 6 days marketing and infrastructure. We spent as little as we could. Design and illustration costs. Legal costs. Payment fees. Hosting was free. We broke even inside 24 hours. Our costs and time investment was low, so our exposure to risk was low. We didn’t stop there. It sold well. Dreamed we might sell one license per day. Piracy wasn’t a big issue. People who didn’t want to pay had plenty of free options already. Support has been an issue. Our primary cost associated with each sale. No frequently asked questions. We made positive changes to prevent questions being asked repeatedly. We ran the stats. 26% of customers contact support. 10% come back more than once. But there’s more. 25% of requests are from the same 50 customers. 15% of requests are from the same 20 customers. 10% of requests are from the same 10 customers. 2% of requests are from one single customer. Support has been an issue. ... but not that big an issue. We found the limitations. After 18 months, we started working on Perch 2. Needed to address design decisions we made early on. People like to create new pages. And manage navigation. And unreasonable things like that. People love using Perch for big sites. The user interface only really worked well for smaller sites. Perch 2. Launched July 2011, two years after Perch 1. Chargable upgrade from Perch 1. We took on too much. New major product version. Updated add-ons. New upgrade tool. New documentation. New website, with license upgrades. Still doing client work. We were still doing client work. And it was beginning to take its toll. 50/50 was the pain point. We couldn’t work solidly on client projects and provide responsive support. In 2012 we turned down most projects. We started being very selective on what we worked on. Perch sales took up the slack. In 2013 we stopped taking new projects. Wound down all existing client relationships by December 2013. Time is money. The more time we spent improving Perch, the more sales increased. No overnight success. 4 years from launch to ending all client work. What we would we do differently? Understand the limitations of a two- person company. Is it really so little? A little issue. Does our strap line give the wrong perception and limit growth? From little to faster. Perch works well for small sites because it’s quick to use. It works well for bigger sites too, and is fast under heavy load. By proactive in reducing support load. Defend core ideas and use-cases. What’s next? We don’t want to make the product more complex. Customers demand more capability as they tire of other larger systems. View Turning a Side Project into a Thriving Business on Notist. In 2009, edgeofmyseat.com was a web development services company with a business model that was fast becoming obsolete. Hear how they made not a dramatic startup pivot, but a steady bootstrapped turn to take a weekend side project and reshape the company around it.